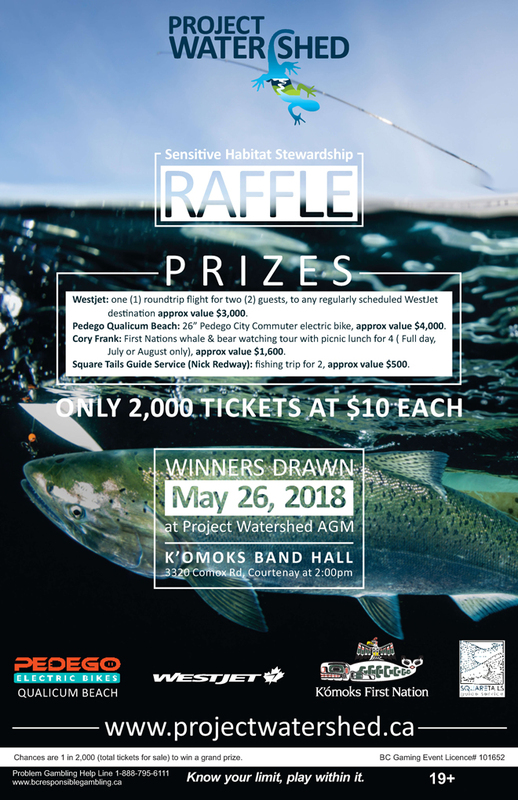 If for no other reason than to be present if your lucky raffle ticket is drawn, come to Project Watershed’s Annual General Meeting and 25th Anniversary celebration in the K’ómoks Band Hall, 3330 Comox Rd on May 26th from 2 to 4pm. While the raffle may be the highlight for some, for others hearing an update on our Kus-kus-sum project straight from our Directors will be the reason to attend. Information on purchasing raffle tickets before the AGM can be found here. Our keynote speaker, Ernie Sellentin, will be giving a presentation on Unique Plants of the K’ómoks Estuary. Admission is free but donations are gratefully accepted! Sellentin’s Habitat Restoration & Invasive Species Consulting Ltd.
Sellentin ran as the Green Party candidate for Courtenay-Comox in the 2017 provincial election. Sellentin has his own company, Sellentin’s Habitat Restoration & Invasive Species Consulting Ltd., specializing in habitat restoration and invasive species consulting. His business is a successful multi-dimensional full service enterprise focusing on environmentally conscious sustainable invasive plant removal and restoration. In addition, he served as a Director on the Board of the Invasive Species Council of BC (2005 – 2009).